Fibromyalgia is a condition that often is a diagnosis of exclusion meaning that it is a diagnosis arrived at after ruling out other conditions. Because of this, fibromyalgia usually takes a long time before it is finally diagnosed which can serve as a source of stress. Once it is diagnosed, there are no easy conventional medical solutions other than pain killers and antidepressants. Symptoms of fibromyalgia usually include widespread muscular pain and tenderness, chronic fatigue, unrefreshed sleep, cloudy thinking, and emotional sensitivity. The degree of pain and fatigue will vary between patients. Complicating matters, there are also many conditions that accompany fibromyalgia such as: IBS, migraines, allergies, and even urinary issues. Fibromyalgia can be caused by either physical or emotional trauma, following an infection, as part of an autoimmune disorder (such as lupus), or may just run in the family. Classically, fibromyalgia is diagnosed after certain criteria are met. One of these being the experience of chronic pain for at least three months. Eighteen specific points along the body are also examined requiring a minimum of eleven of them to present as tender points upon palpation. Finally, patients should also present with pain on both sides of the body involving muscles that are situated above and below the waist. Headaches and migraine are a chief complaint of fibromyalgia patients. The perception of migraine pain is amplified in patients with fibromyalgia. Abnormalities in chemical messengers (such as serotonin and epinephrine) in the brain are though to play a role in this enhanced perception of pain. Many people with fibromyalgia suffer from IBS. This disorder is characterized by abdominal pain, bloating, cramping, diarrhea, constipation or an alteration between constipation and diarrhea. IBS is thought to occur since Fibromyalgia effects the autonomic nervous system. RLS is described as an uncomfortable and even painful tension in your legs. This tension often disturbs the sleep of those with the condition. Other conditions associated with fibromyalgia that can effect sleep are insomnia and sleep apnea. Depression is common among fibromyalgia patients. Life time depressive symptoms exist in up to 90% of patients (2). The same underlying neurochemical problems are thought to be found in both fibromyalgia and depression, but are still considered two separate conditions. 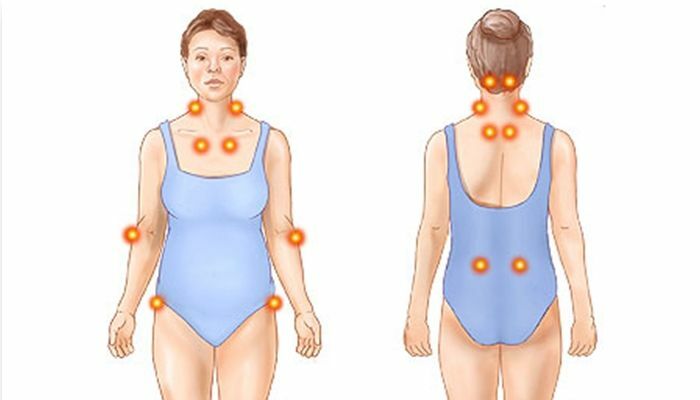 Overweight and obesity seems to be more prevalent in those with fibromyalgia as compared to those without the disease but who are still overweight or obese (3). Obesity seems to further exacerbate the pain perception that is usually experienced by those with fibromyalgia. Diagnosis of fibromyalgia keeps evolving and so doctors may use differing criteria when looking at this disorder. Treating fibromyalgia via naturopathic medicine requires a combination of considerations involving supplementation, relaxation techniques, physical treatments, and lifestyle modification. This fat-soluble vitamin has effects on the proper functioning of nerves and muscles and has been found to be low in those suffering with chronic pain. Testing of Vitamin D and subsequent supplementation, if found to be low, can help the body regain proper functioning of muscle fibers. This vitamin is required for proper functioning of nerves and its deficiency can lead to nerve pain, muscle spasms, foggy mind, and fatigue. Though oral B12 may be of great use, intramuscular or intravenous B12 may also help those greatly deficient in this vitamin. Trigger point injections of this vitamin is also useful in releasing tender myofascial trigger points. This mineral is used in many of the body’s reactions and is often deficient in people suffering from muscle aches. Magnesium has the dual action of relaxing both muscles and the nervous system in general so it can also help reduce stress and elevate mood. This supplement, which is not the same as regular sugar, provides high amounts of intracellular energy for your muscles and helps stop pain. By increasing energy, it also acts to relieve the fatigue experienced by most fibromyalgia sufferers. This therapy stimulates the flow of blood and nutrients to myofascial trigger points which helps relieve them and leads to a reduction of pain. Acupuncture also calms the mind and frees the patient from stress and sleep issues. I would recommend seeking gentle practitioners of acupuncture as we do not want to stress the body with excessive manipulation of acupuncture needles. This is a soft-tissue activation technique which works on the fascial layer sitting on top of the muscles. Often there are problems with this layer leading to a dysfunction of the underlying muscle layer. This type of therapy is also a very gentle technique which often helps alleviate stress and activates the parasympathetic nervous system leading to a deep relaxation state needed for repair. If you are sensitive to foods or chemicals then you need to avoid them as allergens can create low-grade inflammatory immune reactions leading to pain and discomfort. There are many tests from blood examinations to manual muscle testing which can shed light on your sensitivities. Sweets lead to the activation of inflammatory processes within the body which can lead to pain. Also, sugary foods can lead to significantly increased instances of sugar crashes culminating in fatigue and foggy thinking. Studies have shown that choosing more vegetarian foods can help reduce pain in those suffering with fibromyalgia. This can be correlated to the mineral and vitamin rich aspects of vegetables and the fact that it takes less energy to breakdown vegetables than it does meat. It is a good idea to cook or steam your veggies to make them easier to digest. Those suffering from fibromyalgia require more sleep than the standard 6-8 hours. I would recommend 9-10 hours of sleep to help the body recover and repair adequately. This of course means earlier onset of sleep and ensuring you are not disrupted from your sleep. There are many great articles on this site you could refer to for helping with your sleep such as various teas, heavier blankets, and proper sleep hygiene. Meditation, deep breathing, and mild forms of exercise such as Tai Chi can help reduce both physical and mental stress. When we are not stressed, our nerves and muscles will relax leading to less pain and discomfort. The takeaway message from the above examples is to reduce physical and mental stress while nourishing your body with clean foods and providing the body with ample opportunity to rest and heal. Teitelbaum, J.E., Johnson, C., St. Cyr, J., “The Use of D-Ribose in Chronic Fatigue Syndrome and Fibromyalgia: A Pilot Study”. The Journal of Alternative and Complementary Medicine. 2006, 12(9): 857-862.